After almost three intensive years of following Jesus the disciples had heard many ideas and opinions about who Jesus is. Great answer Peter. But more importantly, how you and I answer that question determines where will spend eternity. We need to get it right! Our current sermon series Jesus is _________ (March 10 through Easter Sunday) will be searching the scriptures to answer who “Jesus is_________? We’ll be exploring a different attribute each week with the hope and prayer that we’ll all know Him better personally and be better prepared to proclaim Him to the world who asks us (and needs to know) who Jesus is! AS you leave worship each week, we’ll hand you a few key scriptures to take home for personal growth and study. 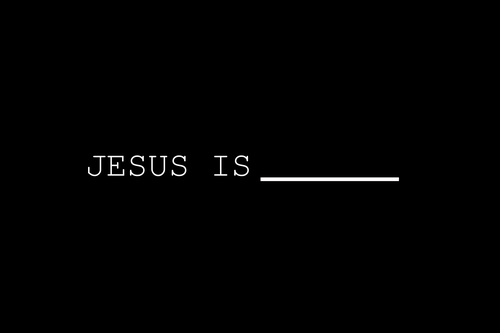 When you come to worship the next Sunday you might be prepared to fill in the blank for that Sunday answering the question who “Jesus is ____________”. We’ll be creating a banner together all through Lent starting this Sunday. Each week you’ll be invited to add to the banner your own words and expressions of faith and hope in who Jesus is___________. The BIG REVEAL. On Easter Sunday one final word be revealed made from the first letter of each attribute from all 6 Sundays in Lent, Good Friday and Easter Sunday. 7 weeks, 8 words will define who Jesus is_____________. I hope you’ll be a part of it all each week as we search the Scriptures together discovering who Jesus is ____________!